"Night of the Three Divas"
The Stratford Festival is presenting two world premieres on a double bill at its Studio Theatre. The first is “The Measure of Love” by Nicolas Billon. The second is “Ruth Draper on Tour” devised by company member Raymond O’Neill. While the two works are better linked than some of the double-bills seen here in the past, the 90-minute-long “Ruth Draper” would likely be better served if presented on its own. Last year Stratford premiered Billon’s “The Elephant Song” at the Studio. That one-act play proved to be derivative and contrived. So is this. Sharon Pollock “Blood Relations” and Michel Marc Bouchard “Lilies” loom in the background. Still, it’s possible that Billon could salvage the core of the play to make a better work. We meet the actress Mabel O’Neill, who has caught up with Joan Sinclair, a nun, once her best friend in convent school, whom she has not spoken to for 40 years. Mabel gives Joan a present, a play she has written recounting their girlhood friendship. It concludes with an occurrence during a performance of “Romeo and Juliet”, in which they played the leads, that lead to the break-up of their friendship. Mabel has done this both because she is losing her memory and because she wants to apologize to Joan for what happened. Mabel wants Joan to act the play with her, Joan script in hand, Mabel without, to re-enact those events. If this were all to the play, it could be taken as a gentle study of two middle-aged women learning to be friends again, even though what happens during “Romeo and Juliet” seems hardly likely to have caused a rift between two girls who have sworn eternal friendship. What’s harder to swallow is that Billon wants us to believe that this reconciliation between Mabel and Joan is taking place in front of a live audience, i.e. us. Mabel tells us we are her “courage”, her “Greek chorus”. That last phrase reveals Billon’s pretension. We may be Mabel’s audience, but since when does a Greek chorus sit in darkness and silence? Much humour is derived from Joan’s embarrassment at finding herself in front of an audience and having to act for them, but for anyone as shy as Joan, to be surprised and embarrassed in such a way would likely lead to flight and only widen the rift between the friends, not heal it. Billon’s desire to give the play a trendy metatheatrical framework has overridden any sense of human nature. Setting aside these flaws, Diana Leblanc as Mabel and Fiona Reid as Joan give wonderfully warm performances. There’s much pleasure in seeing the two contrast their present middle-aged selves with themselves as teenagers. Leblanc balances Mabel’s present anxiety against her past confidence. It’s too bad Billon forgets to follow up in any meaningful way Mabel’s fear of memory loss. Reid, a master in playing embarrassment, wrings all the humour from Joan’s strange situation. Ultimately, Leblanc and Reid under the direction of famed Quebec actor and director Jean-Louis Roux do far more to make their characters’ relationship seem real than Billon does. “Ruth Draper on Tour” does everyone a service by bringing to our attention one of the great women of 20th-century theatre as well as providing a tour de force role for Lally Cadeau. Ruth Draper (1884-1956), born to an upper class family in New York City, had a knack for imitation and developed monologues she would perform at private parties. These were not comic monologues as we now know them but one-sided conversations Draper’s character would hold with one or more invisible characters. Renowned pianist Ignacy Paderewski encouraged her to take her gift beyond the parlour to the stage. After private performances for Queen Mary, Draper made her professional debut in London in 1920. From that point on she toured the world without pause winning acclaim wherever she went. Interest in Draper has revived recently with the discovery of sound recordings she had made in the 1950s that now have been re-issued on CD. Raymond O’Neill has fashioned his play from six of Draper’s 60 or so monologues interspersed with diary entries and extracts from her letters to her friend Harriet beginning just after her London debut. The play’s primary flaw is that these extracts fail to establish Draper’s métier or character sufficiently--rather important since few if any in the audience will know anything about Draper. O’Neill has Draper briefly refer to her “monos” as if we knew she meant “monologues” instead of “recordings”, “diseases” or “monochromes”. These extracts do little more than tell us in what major city we are and which famous people Draper has met or have seen her show. All O’Neill need do is improve these transitions because Lally Cadeau’s handling of the monologues themselves is marvellous. The first two sketches “At an English House Party” and “The Actress” make a good contrast and reveal Draper’s technique. In the first as an upper-crust matron paints portraits for her unseen interlocutor of various people she’s invited to her house party, it becomes clear she doesn’t much care about any of them. Then Draper enters as four of the women described, showing us characters widely divergent in accent, style and personality, who comically happen to act exactly as the matron said they would. In “The Actress”, Draper uses the opposite technique. We see an egocentric French actress in her apartment speak in entirely different ways to her different people according to what she wants from them. She barks at the servants, acts helpless with the American backer, flirts with the poet to get him to enlarge her scene, rails at her agent in a hilarious, fictitious Slavic language, butters up her co-star whom she’s just savaged to the poet and summons up phony graciousness when a party of people arrive whom she’s forgotten she’d invited. “A Debutante at a Dance” with its empty-headed speaker is straightforwardly comic, while “On the Embankment” about a poor woman who finds an abandoned baby on Christmas Eve is sentimental and “The Charwoman” is understatedly tragic. The final monologue “Showing the Garden” is the funniest. As the imperious gardener/hostess shows her guests the garden, rattling off made-up names of each species, it gradually becomes clear that everything she is showing has either died, finished blooming, not bloomed yet or has been torn out. 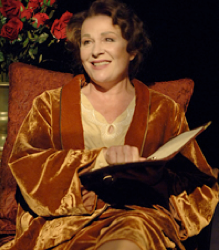 Lally Cadeau distinguishes the ten different characters in the play perfectly showing that she is as much a master of accents and character as Draper is said to have been. After her dazzling performance you can only wonder why the Festival has not featured her talents more prominently in its mainstage shows. Designer Douglas Paraschuk has created a clever set that highlights the elements of theatre and writing so prominent in both plays. His costumes for Cadeau allow her to make quick changes from character to character by simple changes of accessories. Louise Guinand’s lighting lends both plays an appropriate nostalgic glow. Though the authors of both plays need to revise their work, the problems in “Ruth Draper” are more easily soluble and, when resolved, that play is more likely to go on to further success since it provides such a plum role for an experienced actress. Nevertheless, the current double-bill even as it is can be enjoyed a kind of “Night of the Three Divas”, an intimate showcase for the mighty talents of three Canada’s finest actresses.